When you need to count the characters in cells, use the LEN function—which counts letters, numbers, characters, and all spaces. For example, the length of "It's 98 degrees today, so I'll go swimming" (excluding the quotes) is 42 characters—31 letters, 2 numbers, 8 spaces, a comma, and 2 apostrophes. 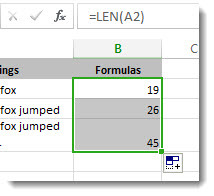 To use the function, enter =LEN(cell) in the formula bar, then press Enter on your keyboard. Multiple cells: To apply the same formula to multiple cells, enter the formula in the first cell and then drag the fill handle down (or across) the range of cells. =SUM((LEN( cell1 ),LEN( cell2 ),(LEN( cell3 )) )). Here are some examples that demonstrate how to use the LEN function. Copy the table below and paste it into cell A1 in an Excel worksheet. Drag the formula from B2 to B4 to see the length of the text in all the cells in column A. The quick brown fox jumped. The formula counts the characters in cell A2, which totals to 27—which includes all spaces and the period at the end of the sentence. NOTE: LEN counts any spaces after the last character. Press Ctrl+C to copy cell B2, then select cells B3 and B4, and then press Ctrl+V to paste its formula into cells B3:B4. This copies the formula to cells B3 and B4, and the function counts the characters in each cell (20, 27, and 45). In the sample workbook, click cell B6. In the cell, enter =SUM(LEN(A2),LEN(A3),LEN(A4)) and press Enter. This counts the characters in each of the three cells and totals them (92).